Pennyroyal is an aromatic herb that belongs to the mint plant family. The herb is native of Europe, the Middle East, and North Africa. The herb, characterized by its spearmint-like aroma when crushed, comes in many other names such as mosquito plant, pudding grass, and squaw mint. According to the Healthy Focus website, the plant is traditionally used as a culinary herb and as a staple in folk medicine. Essential oils extracted from pennyroyal are used in aromatherapy as a topical application. However, the oils are extremely toxic and should not be ingested. Essential oils extracted from pennyroyal contain anti-hysteric properties that sooth the nerves and the brain. The is particularly beneficial to patients with hysteria who suffer from various hysteric attacks such as convulsions, unconscious violent behavior, and fainting. According to the Organic Facts website, the herb’s powerful effect against hysteria is important in keeping these attacks at bay. Likewise, the plant is found to contain sedative properties that help ease nervousness. Patients with arthritis and rheumatism are also more likely to benefit from this herb. Pennyroyal oils possess depurative properties that numb the nerves and eliminate excess uric acid from the body. Likewise, pennyroyal is valued for its cordial and stimulating properties that promote blood circulation. A combination of these properties alleviate pain and improve nerve health and blood flow in patients. Both pennyroyal tea and essential oils may alleviate digestive issues as well. Pennyroyal oils can be used as a topical treatment to relieve excess gas and bloating, while pennyroyal tea may promote digestion and soothe stomach pain. Pennyroyal tea also contain choleretic effects that bolster liver health and facilitate bile segregation. The herb is also shown to fortify the immune system and clear the respiratory tract. An article posted on the One How To website notes that pennyroyal possesses antipyretic properties that combat infections such as colds and flu. As with other members of the mint family, pennyroyal contains expectorant properties that rid the respiratory tract of harmful secretions. 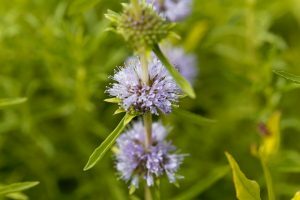 Pennyroyal contains strong antiseptic properties too, which is essential in warding off wound infections and accelerating healing. This effect is also important in keeping infections of the urethra, kidney and uterus at bay. In addition, the plant’s emenagogue properties help maintain a regular menstrual cycle in women. Pennyroyal is especially helpful in maintaining brain health and soothing the nervous system. Likewise, the herb is an excellent food fare to boost blood circulation and overall digestive profile. The plant also enhances the immune system and ensures a healthy respiratory tract. Moreover, pennyroyal is beneficial to the female reproductive health and supports the urethra, kidney, and uterus. The aromatic leaves of pennyroyal are a staple to a variety of industrial products such as room fresheners and deodorants. Likewise, essential oils obtained from the herb is traditionally used in aromatherapy. Pennyroyal is also used to flavor a variety of meat and vegetable dishes, according to the Herbs 2000 website. The herb is commonly brewed as hot tea as well. Pennyroyal relieves both nervous system conditions and digestive issues. Pennyroyal fends off various infections and respiratory illnesses. Pennyroyal boosts brain health, blood circulation, and immunity. Pennyroyal improves digestive profile and urinary system’s health. Pennyroyal supports female reproductive health.